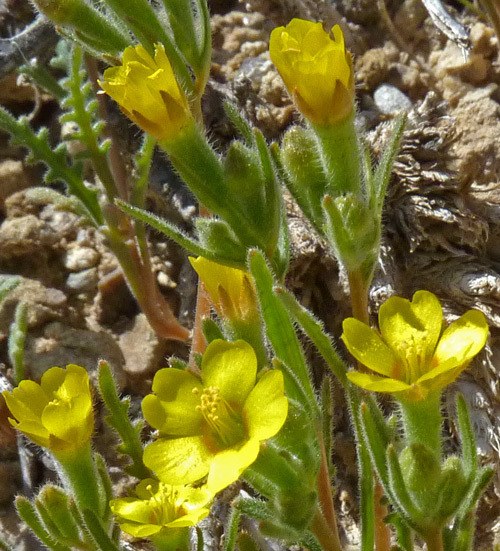 The Mentzelia genus is, in the words of Intermountain Flora, "a difficult group taxonomically. [There is] a close relationship... among many of the taxa and [a] confusing array of intermediates.... The taxonomy of [most of the Mentzelias] at the level of species is beset with difficulties, and there is presently no generally accepted interpretation." 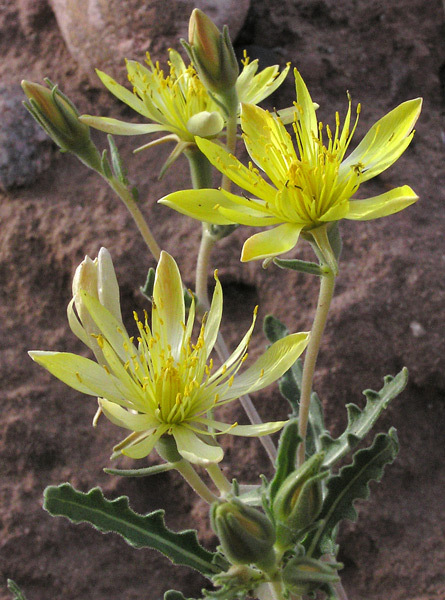 Stanley Welsh, author of A Utah Flora, says, "Plants in this genus are sometimes difficult to place with certainty.... The notorious variability of plant size, leaf size, shape, and lobbing, flower size, and size and shape of capsules contributes to the difficulty. Many of the features grade hopelessly into each other". 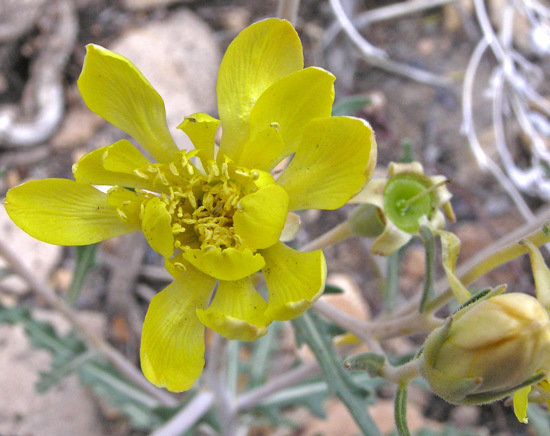 So don't feel bad about not being certain of the identification of Mentzelia species. I don't. 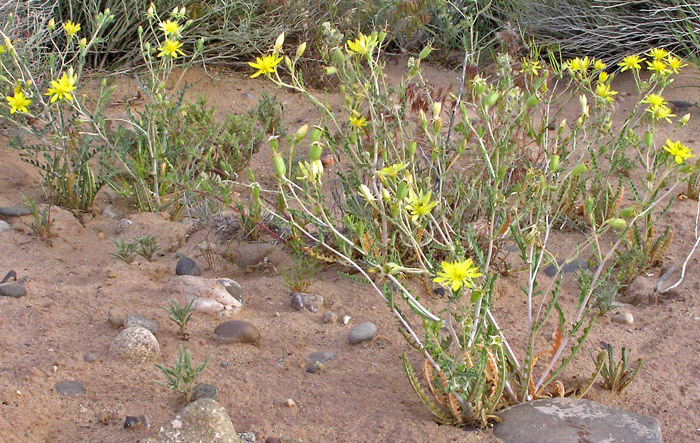 The first species below, Mentzelia albicaulis, is distinct enough to feel confident about. The next species is probably Mentzelia pterosperma but it is possible these are Mentzelia multiflora or hybrids. Whatever the names of the plants are, they are very lovely and interesting. The flowers are bright yellow and numerous and the hairs are really special. William Weber says: "The sandpaper surface of the leaves of Loasaceae is caused by some of the strangest plant hairs known". The hairs are much longer than broad; they narrow very gradually so they look like a cell tower. Each hair is multicellular, giving the appearance of a layer cake, each layer a translucent cell armed with a ring of two-to-six hooks. A careful look through the microscope shows that although most hooks point downward, some point straight out, some upward. All the hairs are relatively stiff. These characteristics add up to nature's velcro. 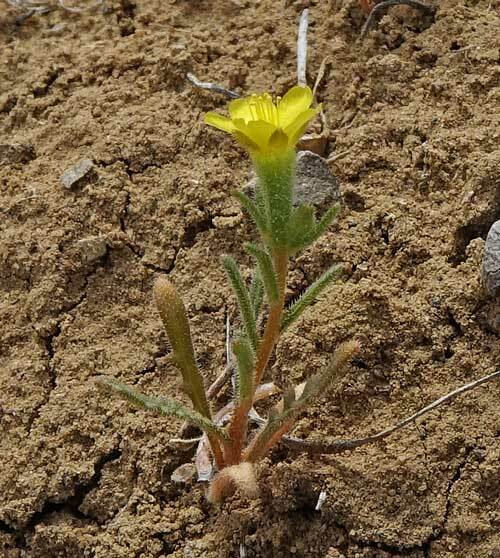 Click for Bob Sivinski's key to Mentzelia. McElmo Canyon, Canyons of the Ancients National Monument, April 25, 2009. McElmo Canyon, Canyons of the Ancients National Monument, April 2, 2005. 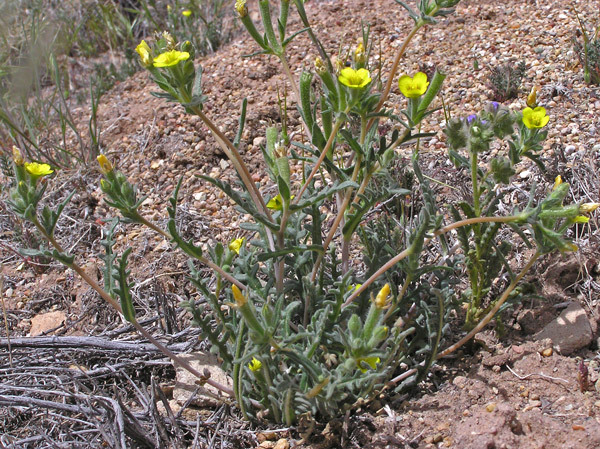 This very slender, daintier cousin of Mentzelia pterosperma (below) is often more numerous, but because of its often minute size, it is more difficult to find. Its stem is quite light in color ("albicaulis") and its basal rosette of leaves and its flowers are small. Flowers appear at first to be pointed but after many hours they open slowly into distinctive, tubular flowers with lobed petals. Flower stems frequently nod. 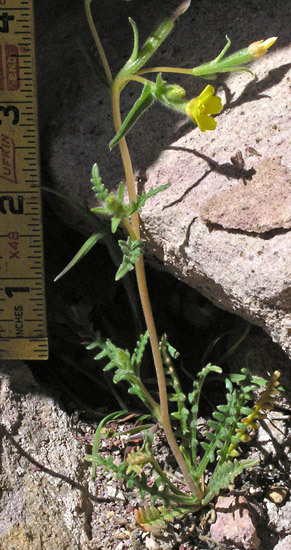 Plants are often only about six inches tall but do grow to about a foot tall. "Albicaulis" is Latin for "white stemmed" and "acrolasia" is from the Greek for "summit hairs" and refers, Weber theorizes, "to hairs at petal tips". Mentzelia albicaulis grows singly or in showy masses. It grows to just an inch or so high (as in the top photograph at left) or it can grow to a foot tall. 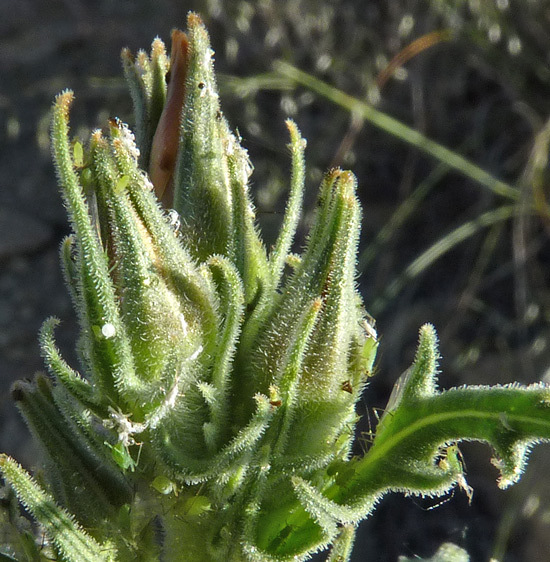 The plant has innumerable and memorable pagosa-shaped hairs that cling like velcro. Try a leaf on your shirt. McElmo Canyon, Canyons of the Ancients National Monument, April 18, 2010. 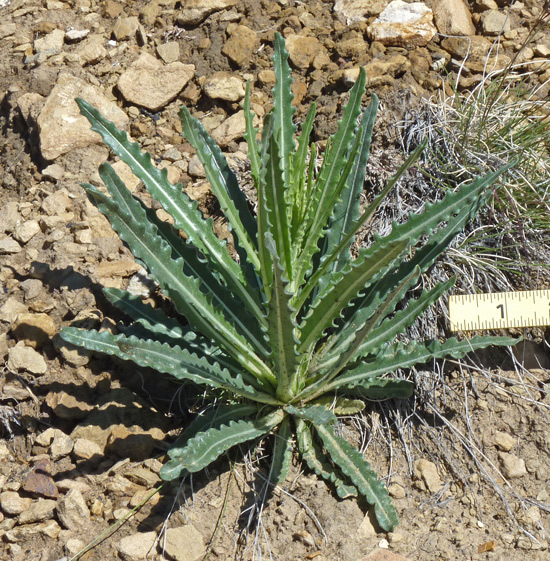 The first three photographs below show a young plant on a hot, south facing, steep, gravelly slope. 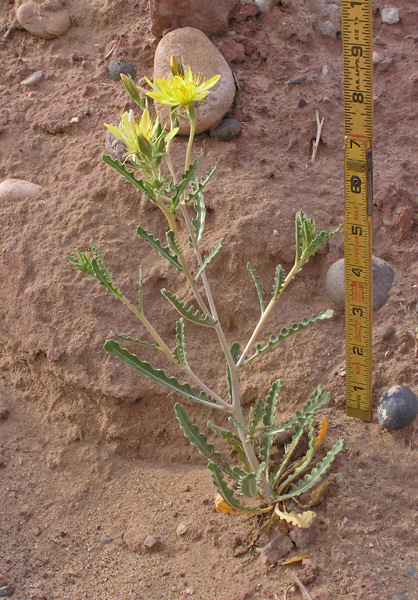 The photograph immediately above shows a plant one month later at the side of a road where it received good moisture in richer soils. 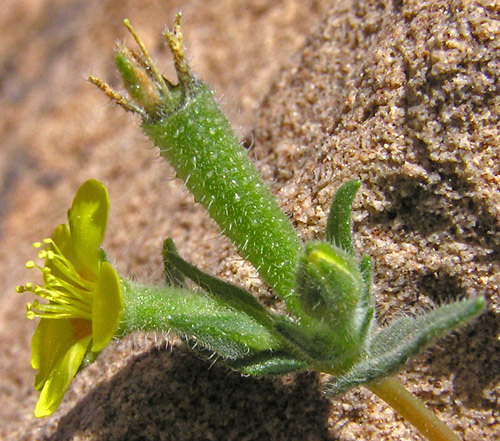 I have identified both plants as Mentzelia pterosperma, but it is possible that one or more are Mentzelia multiflora. These two species are so similar that floral keys do not agree on the characteristics that separate them. As the discussion at the top of this page indicates, this genus is in need of considerable work and precise identification of species is often difficult. 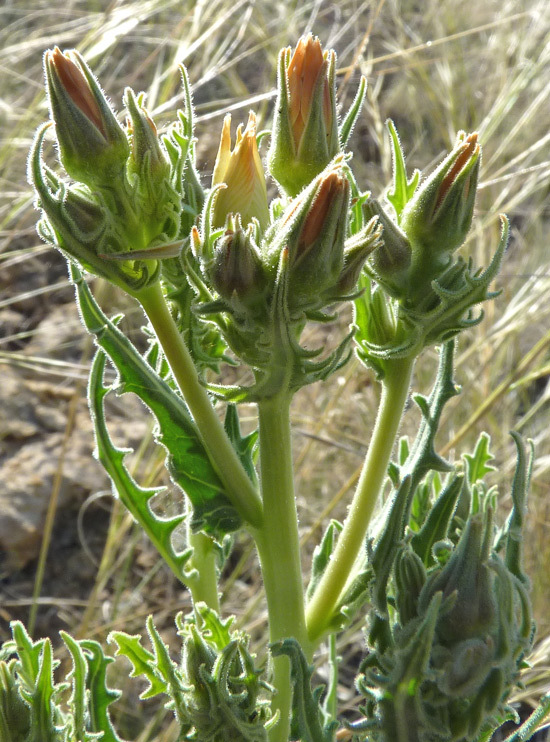 The lobed, undulating leaves of Mentzelia pterosperma are large, distinctive, and eye-catching. The stem is stout, straight, and quite light white/yellow. 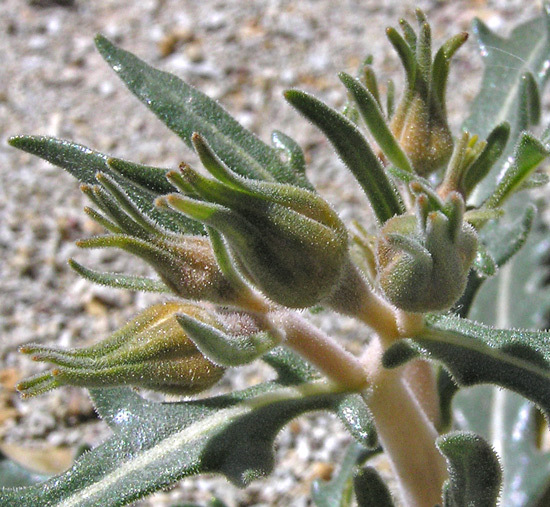 The buds are unusual in both their orange-to-green color and their open, flared tips. Plants grow to over a foot tall. Thomas Nuttall was a widely traveled collector, highly respected Harvard botany instructor, and expert taxonomist in the 19th century. (Click for more biographical information about Nuttall.) "Pterosperma" means "winged seed". Leaves, buds, stems, and fruit of plants in the Loasaceae are covered with stiff, hooked hairs that cling to fingers and clothes. 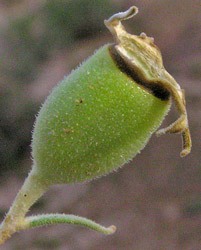 The nearly open bud can be seen in the lower right, and the developing seed pod is just to the right of the flower. Flowers often open at night and are rarely open in sunshine. East of Aneth, Utah, May 3, 2007. Canyons of the Ancients National Monument, March 15, 2011. 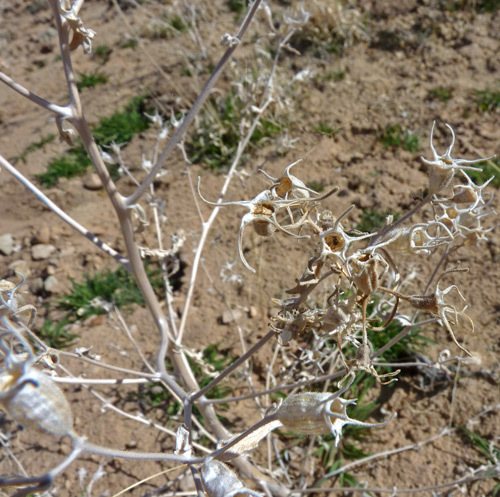 Dried, white-to-straw colored plants over-winter and persist into the spring. 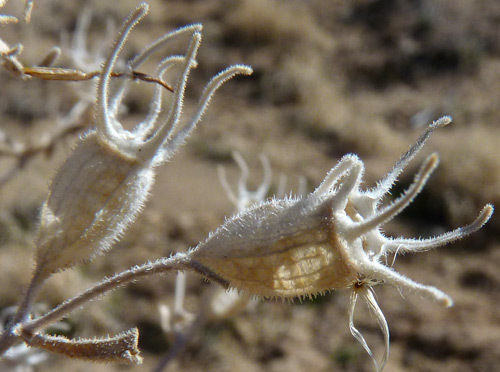 Surrounding these dried plants, you will find green, basal leaf rosettes which grew from the seeds of the dried plants. The next spring the rosettes will grow and the new plant will flower. Carpenter Natural Area, June 8, 2014. Although the Mentzelia genus is a difficult one, Mentzelia rusbyi has characteristics that stand out and make it easy to identify. The plant grows to 3 feet tall, it branches above the mid-point of the stem with upright branches, and the petals are usually erect. 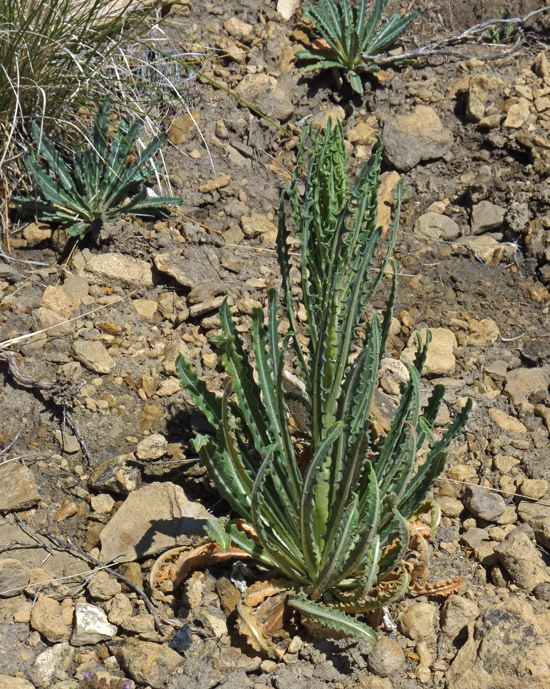 Like some other Mentzelia, M. rusbyi has stems that are stout and straight. They tend to be green to yellow-green. Flower color ranges from white, to light yellow, to light yellow with tinges of apricot. Carpenter Natural Area, May 26, 2014. Basal rosettes are huge with very attractive bright green leaves, a wide and white mid-vein, and gently undulating margins. 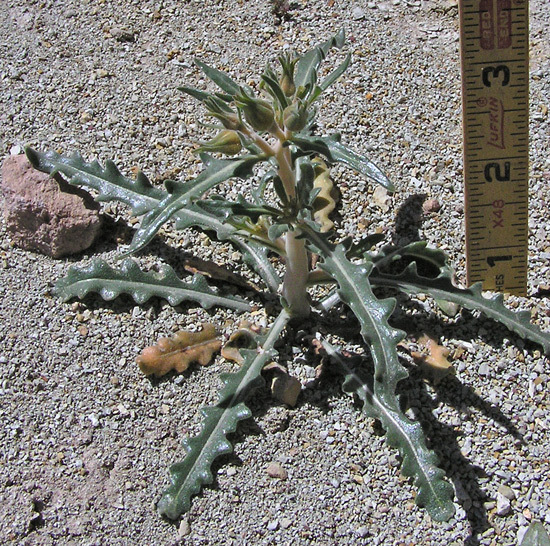 Basal rosettes quickly grow leaves to 6 inches long and within 2-3 weeks the stem elongates to 2-3 feet tall. The stem shown at left is 14 inches tall. Soft early morning light illuminates the myriad of hooked hairs characteristic of Loasaceae. Look carefully and you will see the Aphids that were abundant on these plants.